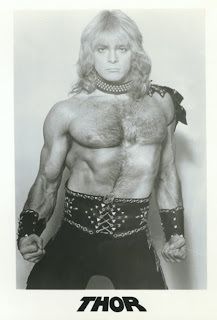 We'd been feeling the metal urge and this week we turned our focus on a man that can literally bend metal on stage... Thor's Jon Mikl Thor. We talked with him about his career and featured a few live ("Lightning Strikes" and "Warriors Of The Universe") and studio tracks ("Thor Against The World" and "Call Of The Triumphant".) We can now say we've had our strongest show yet. Beware your electronics when talking to the Norse god of thunder as something happened to our audio during the interview (crackling) and after. We've replaced our sound card. As you can tell, the audio sounds crisper. Definitely a blessing from the gods. from "Best Of Thor (Vol. 3)"
from "Thor Against The World"